A Brody Development features lifestyle living in the heart of Lynn Valley North Vancouver real estate market. Marketed as Vicinity at Lynn Valley homes for sale, these new townhouses are located in one of the most sought after neighbourhoods that has been going through a major transformation and revitalization over the past decade. Living in close proximity to nature trails, shopping and urban services are what the new North Vancouver Vicinity Townhomes in Lynn Valley real estate market can offer potential homebuyers. In addition to all the great outdoor recreation options and pursuits in and around Lynn Valley North Shore, the Vicinity townhomes also over a very peaceful and quiet neighbourhood with tree lined streets and pedestrian friendly walkways. Located right at Lynn Valley Road and Mountain Highway, these new Norh Vancouver homes for sale at Vicinity Townhouses are also family friendly, allowing many Lynn Valley residents to stay in a community in which they grew up in and know very well. Fromme Mountain and tonnes of parks, hiking/biking trails in addition to Lynn Canyon Park are just a stone throw away from the new Vicinity North Vancouver Lynn Valley homes for sale. In addition, these presale North Shore townhouses will also be within a short drive to the popular Karen Magnussen Recreation Centre where you will find a skating rink, swimming pool, wave pool, fitness gym and many other aerobic and community group activities. The new Town Centre with its brand new library in addition to the Lynn Valley Mall are also very close to the new North Vancouver Vicinity Townhomes in Lynn Valley real estate market, making life, work, and play very convenient for residents at this new Brody Development. Offering a very rare opportunity for a truly urban lifestyle within a quiet neighbourhood on the North Shore, these new Lynn Valley homes for sale at Vicinity North Vancouver are now previewing for sales. NEWS FLASH: Tim has set up a presentation gallery (trailer) on-site with all the floorplans and pricing. For advanced previewing of the Vicinity Lynn Valley homes for sale in North Vancouver, please contact Tim today for all the details. Currently accepting offers and already in the presales phase, these new North Vancouver Vicinity townhomes in Lynn Valley will be sold out very soon. Marketing by Tim of RE/MAX, one of the best and most established agents on the North Shore, Brody Developments has launched the boutique Vicinity Lynn Valley homes in North Vancouver real esate market. Vicinity Lynn Valley townhouses is a rare opportunity that offers residents and home buyers an extraordinary lifestyle, a home surrounded by the natural beauty of North Vancouver, together with the amenities and conveniences of Lynn Valley City Centre. With more than thirty years of building experience, Brody Developments is best known for their quality construction, superior finishing and attention to detail in the building of distinctive, sustainable real estate developments that complement the beauty of their natural surroundings. The interiors of the Brody Development Vicinity Lynn Valley homes for sale in North Vancouver is by award winning architect Integra Architecture Inc. The Vicinity North Vancouver townhomes definitely have a distinct West Coast craftsman architecture with Forma Design Inc in charge of the landscaping. With trees and greenery native to the area and showcases of stonework by local artisans, the exterior architecture and landscaping at the North Vancouver Vicinity Lynn Valley homes for sale are absolutely stunning from looking at their renderings. All floor plans at the Lynn Valley Vicinity homes are either three or four bedroom homes and the finishing palettes are designed by Janet Marx Interior Design. Nine foot ceilings, imported slate/tile floors in the kitchens, bathrooms, entryways in addition to fireplaces with custom surrounds and Energy Star appliances in the spacious kitchens are just some great interior design features and finishes here at the North Vancouver Vicinity Lynn Valley homes for sale. Add in separate enclosed showers from soaker tubs, designer styled cabinetry, large bedrooms and heated floors, and you have a luxurious residence in the heart of the Lynn Valley real estate market. Sustainability and environmental sensitivity have always been priorities for Brody Development. Vicinity Lynn Valley homes was constructed with durable, sustainable materials and present appliances and other household features which promote energy efficiency and resource conservation. Vicinity Lynn Valley Homes Open House This Weekend! Prospective Vicinity Residents; Thank you for your interest in our newest North Vancouver Lynn Valley real estate project. Like the ones before it, Vicinity promises to be a premier Lynn Valley address in the neighborhood. We will begin marketing the Viciniy at Lynn Valley homes for sale this weekend. Our North Vancouver Vicinity Sales Office is located on site at 3015 Baird Street and open from 12 - 4 pm both Saturday and Sunday. If for some reason you cannot make those times feel free to call me and we will make an appointment that is convenient for you to view the new Lynn Valley Vicinity Homes in North Vancouver. I hope to see you over the weekend. Thanks, Tim at Re/Max Crest Realty. 604.889.9447. The interiors of these fabulous new North Vancouver townhomes for sale are designed to maximize comfort, style and room and are by Janet Marx interior design group. Homebuyers will have the ability to choose between two beautiful finishing palettes, both of which are sophisticated and elegant, and won’t go out of style the minute you move in. The new North Vancouver townhomes at Vicinity at Lynn Valley homes will incorporate luxury features and finishes throughout the residences that include wood baseboards and molding, panelleled doors with distinct hardware, nine foot ceilings on the main living level and fireplaces with custom built and designed mantles. In addition, the kitchens, bathrooms and entry way at the Lynn Valley Vicinity townhomes for sale will feature imported tile/slate floors and the sumptuous bathrooms will have in floor radiant heating technology to keep you warm. Every detail has been taken care of by Brody Development at the North Shore Vicinity Townhomes at Lynn Valley homes for sale including closet organizers in the bedrooms, in suite washer and dryer (stackable to save room), mini blinds on most of the windows in your home, IAQ labelled high-end carpeting in the bedrooms as well as designer light fixtures with Decora rocker light switches throughout. The kitchens at the new Lynn Valley Vicinity Homes in North Vancouver property market are also very well finished and equipped with designer cabinets, granite countertops in addition to Energy Star appliance set including microwave, double bowl sink, garburator, freezer/fridge combo, self cleaning gas range. Your North Shore home purchase will also include a natural gas barbeque oulet on the patio, recess and pendant halogen lighting, vegetable sprayer and chrome facuet in addition to built in recycling bin, roll out pot drawers for convenience, a handy spice drawer and lazy susan setup to maximize your storage capabilities. In terms of the bathrooms at the new North Vancouver Vicinity Townhomes in Lynn Valley, you can expect spacious master ensuites with heated in floor tiling, acrylic soaker tubs, separate enclosed walk-in shower with tiled surround, designer cabinetry, chrome faucets and granite/laminate counters. Vicinity at Lynn Valley real estate development provides superior craftsmanship and thoughtful details that are unmatched by any other North Vancouer condo offering. The architecture is designed by Integra Architecture Inc, and is a true West Coast Craftsman style. In addition, all new North Vancouver Lynn Valley Vicinity floor plans will have three bedroom layouts with double car garages, two parking stalls per home and lots of storage area. There are also two units at the Vicinity at Lynn Valley North Shore Townhouses that offer four bedrooms, which are ideal for growing families. Construction is 2”x6” and the exterior of the townhouses will have sustainable siding material that is low maintenance and very durable. In addition, there is forced air heating, natural gas fired hot water, Energy Star rated double glazed windows throughout and wood trim, molding and fascia. Party Wall soundproofing has been incorporated to reduce sound transfer and the new presale North Vancouver townhomes at Vicinity Living will provie sprinkler systems and the 2-5-10 year home warranty on all new purchases. The exterior landscaping for the Lynn Valley Vicinity townhouse community will be designed by Forma Design Inc and the exteriors will have stonework by local artisans, lots of greenery and two decks or patios per floor plan. The gardens are fully irrigated for low maintenance living and there are also privacy partitions between each new Vicinity North Vancouver home in Lynn Valley real estate market. There is enclosed parking for each townhome in addition to smoke/CO2 detectors hard wired, and deadbolt security entry locks, remote control overhead door openers and sprinkler systems for your safey and security here at the Vicinity at Lynn Valley homes for sale. Sustainability is a key success for the Vicinity North Vancouver townhome development and each homeowner will receive a Silver Rating/Built GREEN checklist. There are four optional upgrades that include: electric range, appliance package upgrade, hardwood flooring and vacuum canister. Coming Soon! The Vicinity North Vancouver Lynn Valley townhouse development is coming soon to the North Shore’s most popular and sought after neighbourhood! North Vancouver lifestyle with an urban edge is available. 14 distincitve well appointed North Vancouver townhomes at Vicinity Lynn Valley real estate market surrounded by the beauty and tranquility of Nature, but with shopping, urban amenities and outdoor recreation just steps away from home. For more information about the new North Vancouver Townhomes at Vicinity Lynn Valley townhouses for sale, please visit www.vicinityliving.com today. Real estate marketing for the Vicinity North Vancouver townhomes for sale is by Tim at 604.990.0003, RE/MAX. 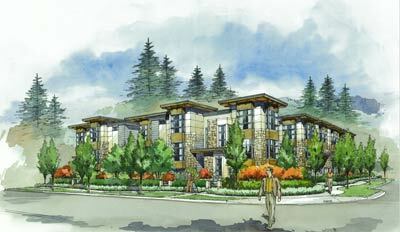 The luxury North Van townhomes at Vicinity at Lynn Valley are brought to you by Brody Development Group. There are five floor plans featured at Vicinity North Shore that includes Peak Plan A that is 1424 to 1431 sq ft, Park Plan B which is 1412 to 1418 sq ft, Canyon Plan C which is 1553 – 1568 sf, Library Plan D which is 1385 square feet, and Town floorplan E which is 1491 square feet in size.